Translated fiction for teen readers is not easy to find. Despite the recent success of adult titles by Elena Ferrante, Steig Larsson, Roberto Bolaño, Haruki Murikami, and others, and the growing number of acclaimed picture books from other countries, middle grade and young adult novels in translation haven’t yet received their due. This oversight is particularly troubling given that most high school social studies curricula feature a year or two of global studies, any person who isn’t Indigenous to this land has roots in another country, and many teens travel or study abroad in high school or college. A mandatory 100-level college course should not be someone’s first exposure to international literature. The Head of the Saint begins with 15-year-old Samuel’s long and exhausting pilgrimage from his hometown in northeastern Brazil, where his mother has just died, to the town of Candeia, where his father and grandmother supposedly live. He travels in pursuit of three tasks his mother assigned him on her deathbed. But Candeia is a cursed town, ever since the residents attempted to build a statue to their patron saint, Saint Anthony, and because of a construction error the head could not be attached to the body. Samuel’s grandmother chases him from her home and tells him to hide out in the head. There, he meets 13-year-old Francisco, sneaking away to read pornographic magazines. He blackmails Francisco into helping him, and the two become friends and collaborators in an enterprise to revive the town. While living in the head, Samuel hears voices—a woman singing, women praying to find love. He and Francisco set up a meeting between one young woman and the local doctor that leads to marriage, and then scores of desperate women arrive in Candeia looking for similar magic. The town begins to recover, but secrets are revealed that put Samuel in mortal danger. His promise to his mother involves even more danger, but it may also be the thing that saves him. Readers and writers of magic realism will find inspiration in this exemplary work by Acioli, who wrote The Head of the Saint under the mentorship of Nobel laureate Gabriel García Márquez. Translator Hahn captures the lyrical, dreamlike omniscient narrative (though mostly focused on Samuel), and readers of the US edition will not suspect that he is British or that the novel was first published in the UK. As in other magic realist fiction from Latin America, Acioli explores the official corruption and repression, environmental degradation, and individual malice—things that appear unbelievable but regularly happen in countries and communities all over the world. Acioli’s vivid descriptions bring to life the lush vegetation invading the ruined community, the crumbling mansions of a once-prosperous town, the remaining young residents clinging to life and hope in the face of death. Brazil’s complex ethnic heritages and religious traditions, intertwined with those of Portugal and Cape Verde, are central to the story as well. Acioli weaves all these themes and motifs into an organic whole, showing us that those who know a place best are the ones who live there. At first, some readers may find it difficult to figure out the strange relationships weaving in and out and all around, as well as the symbolism and significance of the statue itself and in particular, the head. But when everything comes together—as it does—the message is satisfying and real. Without giving away the ending, let me say that everything somehow involves “courage,” “forgiveness,” and “love,” which Samuel ultimately comes to understand. 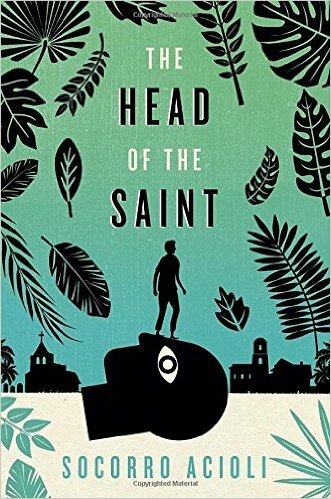 Head of the Saint is highly recommended. This review, in a slightly different form, first appeared in The Pirate Tree (thepiratetree.com). We thank The Pirate Tree for permission.